Multicultural consumers (Hispanics, African-Americans and Asian-Americans) are more digitally connected to music than the total market, per Nielsen data. They’re more likely to typically listen to internet/streaming radio services, on-demand video streaming and on-demand audio streaming, while being less likely to tune in to regular AM/FM radio. Even so, they spend more annually on CDs ($13) than digital albums ($10) and reserve the largest share of their music-related budgets for live events, spending an average of $50 on live music annually. Study results also suggest brands can engage with multicultural consumers via music sponsorships. 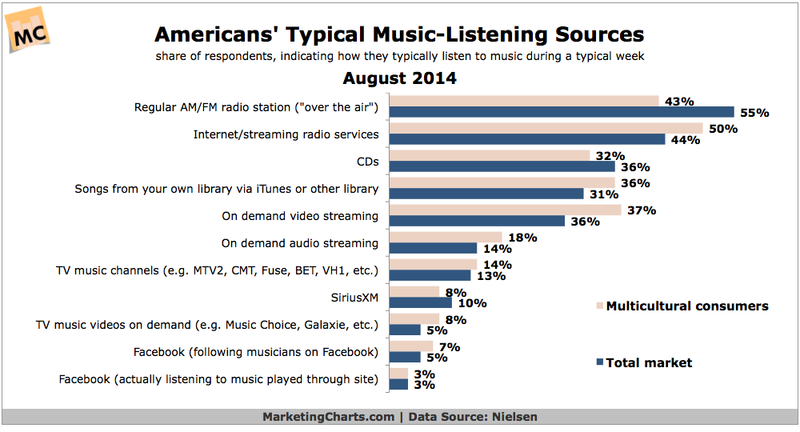 Source: Nielsen Read the rest at MarketingCharts.